Astros starter Dallas Keuchel got bailed out of a jam in spectacular fashion by his tiny left fielder, Tony Kemp, in the third inning of this afternoon’s ALCS Game 3. With the Red Sox already winning 2-1, and with runners on first and second with two down, Steve Pearce blasted a deep ball all the way back into left. All that stood between Pearce and a likely two-RBI double was Kemp, whose listed height is a mere 5-foot-6. 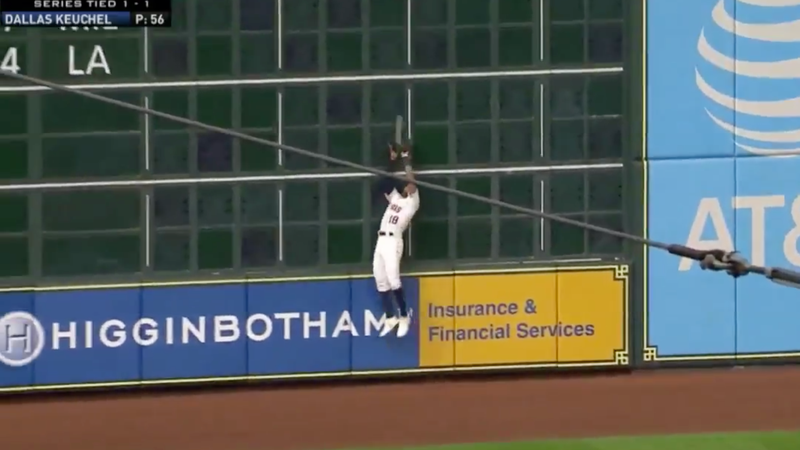 Lucky for the Astros, Kemp isn’t 5-foot-5, because the outfielder needed every inch of himself to rob Pearce. Making as high of a jump as a could, and stretching as far up as he could, Kemp snagged the ball at his apex and ended the inning as he tumbled back down to the warning track.